As well as looking after the archives for Essex, the ERO is also the Corporate Custodian of Art for Essex County Council (ECC). Besides commissioning portraits of its chairmen ECC has never actively collected art, but has received a number of donations and bequests over the decades. Some of this art is displayed in ECC buildings, while other pieces are in storage at ERO. The largest single collection of artwork was donated by the Barrett-Lennard family. 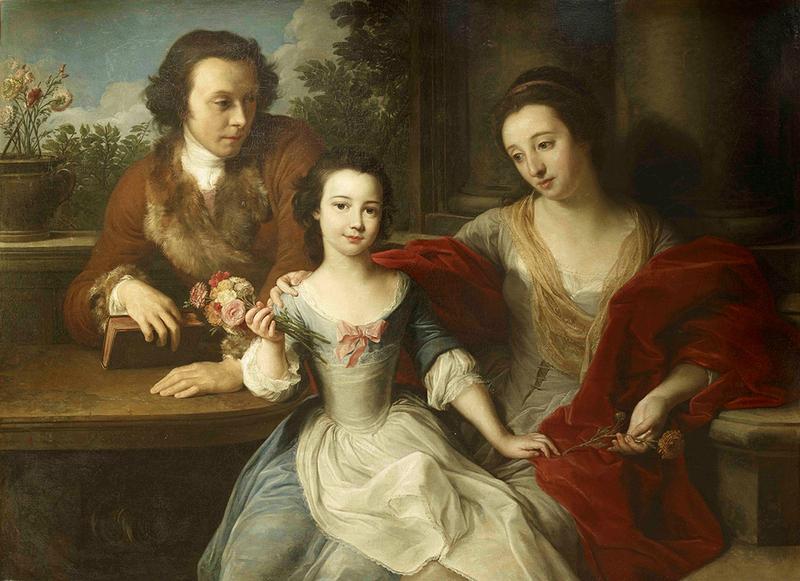 It includes this family portrait by the Italian artist Pompeo Batoni painted in Rome in 1749/50. The painting has a very sad story behind it. It shows Thomas and Anna Marie Barrett-Lennard with their daughter, Barbara Anne, who had died of tuberculosis the previous year. The artist painted her likeness from a miniature by Thomas Hudson which the couple brought with them on their travels. Barbara Anne was the couple’s only child, although Thomas had two illegitimate children with a mistress who were brought up by the couple as their own. The eldest, Thomas Fitzthomas, inherited the estate, and in 1786 he was granted the right to adopt his father’s surname and titles, becoming Thomas Barrett-Lennard (more on that here). A portrait of Thomas Jr by John Opie hangs in the ERO Searchroom. The Barrett-Lennard family lived at the mansion of Belhus in Aveley, which they built up into one of the largest estates in Essex. During Thomas’s tenure, he remodelled the house in the gothic style and employed Capability Brown to landscape the park and gardens. The painting was loaned for The Family in British Art, a touring exhibition that visited Norwich Castle Museum and Art Gallery, the Millennium Gallery in Sheffield, and the Laing Art Gallery in Newcastle in 2011-12. The tour was part of the Great British Art Debate partnered with Tate Britain. It is currently stored at ERO, and is brought out for special occasions for public view. A high quality digital image is available, and anyone wishing to view the original can request for it to be brought out of storage.